​Samarco Mineiracoes, a 50-50 joint venture between Australia’s BHP Billiton and Brazil’s Vale, operates an iron ore mine in Mariana, in the Brazilian south-eastern state of Minas Gerais where three dams used to hold millions of cubic metres of tailings, or mining waste. One of the dams, its second largest, burst on November 5, unleashing 62 million cubic metres of sludge into the Doce River at about 70km/h. It destroyed the town of Bento Rodrigues, killing at least 13 people (12 are still missing), displaced thousands of others, affected water supplies to an estimated 250,000 people and killed fish stocks along 600 kilometres of river in two states. Last week, the mud arrived at the river mouth in Espirito Santo state on Brazil’s Atlantic coast, endangering protected marine species and polluting beaches at important tourist destinations. Indigenous people from the Krenac​ ethnic group have also been affected, with 126 families of the riverside Atora tribe accusing the company of destroying their sacred river. “A lot of people think the river is just water and fish. For us the river is a source of survival and culture. 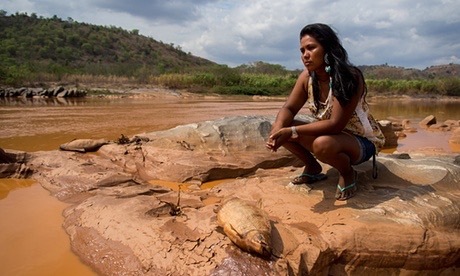 Now the river is dead,” Atora chief Leomir Cecílio de Souza told media outlet UOL. This Post was posted in Activism, Awareness, Environment, Society. Bookmark the permalink.